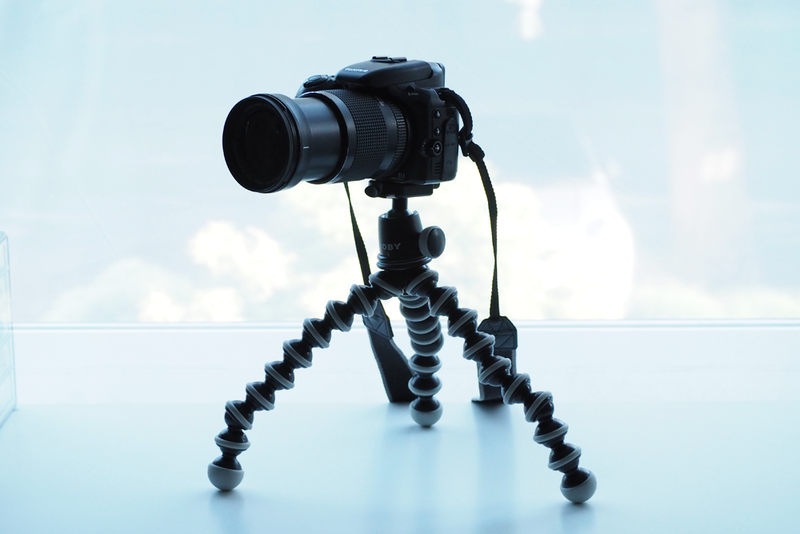 I had always looked at GorillaPod tripods whenever I went into camera shops when I was younger. I thought the design looked really interesting and was something different to all the other ones out there. As I've got more serious about photography in the past few years I had really started to want to get one as I saw times when I would get more and more use out of it for my Fuji Camera. 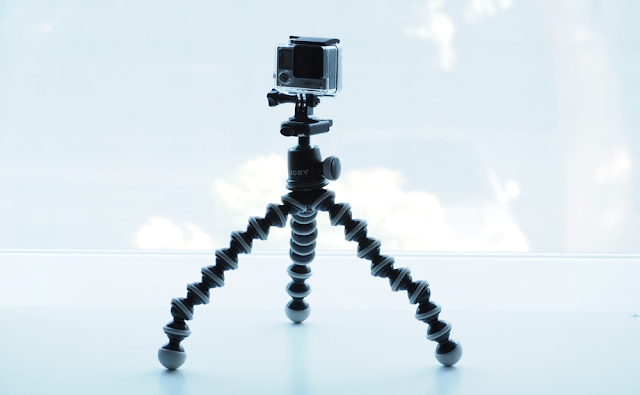 When I bought my first GoPro I was going to get the Action Camera GorillaPod, but then realised I would be much better buying a larger version so that I could use it for both my Fuji and GoPro. After looking at the other versions they do, I ended up going for SLR Zoom model, which can fit DSLR size cameras that weigh up to 3kg. The flexible legs are what makes the GorillaPod's so great as they give you so much freedom for where you can mount your camera and lets you take shots that you might not have otherwise been able to get. The feet have a rubberised outer which means they grip really well on pretty much any surface. Even if you want to lay the tripod out, all of the joints have a rubber ring on the outside which help to keep your camera secure. My Fuji weighs in at just over 1kg so is well within the limit of what you can mount. Even when I have the lens extended to full zoom, the tripod still holds perfectly steady and there is no concern as to whether it will be strong enough to hold it in place. I've used it to take do some night photography and it performed really well, and meant I could get clear and long-exposure shots. I was taking a lot of photos around the Albert Dock in Liverpool and it has a lot of rounded bollards that provided an area to set up my camera where a normal tripod would have been stuck. Even with the smooth surface, the rubber grip held perfectly. I've also made use of the GorillaPod when using my GoPro. All I had to buy extra was the GoPro tripod mounts and it slotted on in no time. 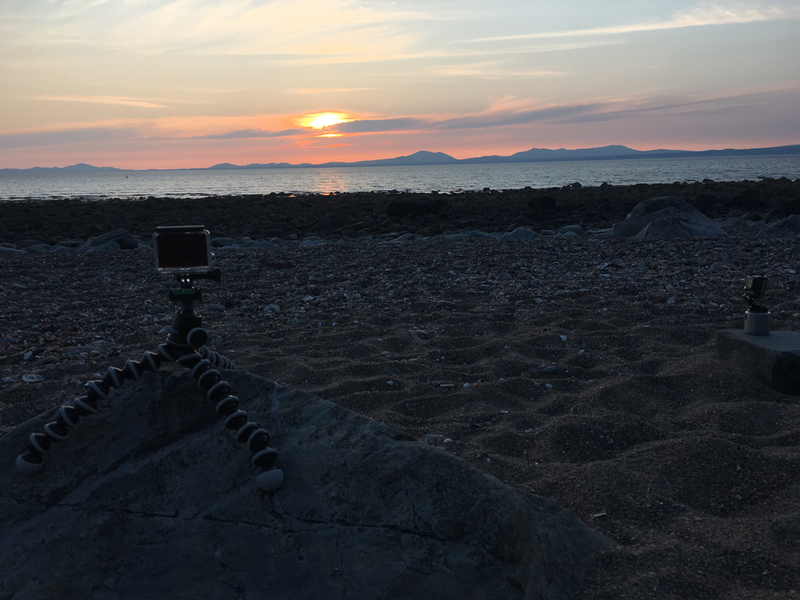 I have mainly used this for taking time-lapses of things such as sunsets as it gives me a stable base to leave it running from so that you end up with a high quality time lapse video. I can easily carry my GoPro around when it's still attached to the tripod as the joints make it easy to hold onto. 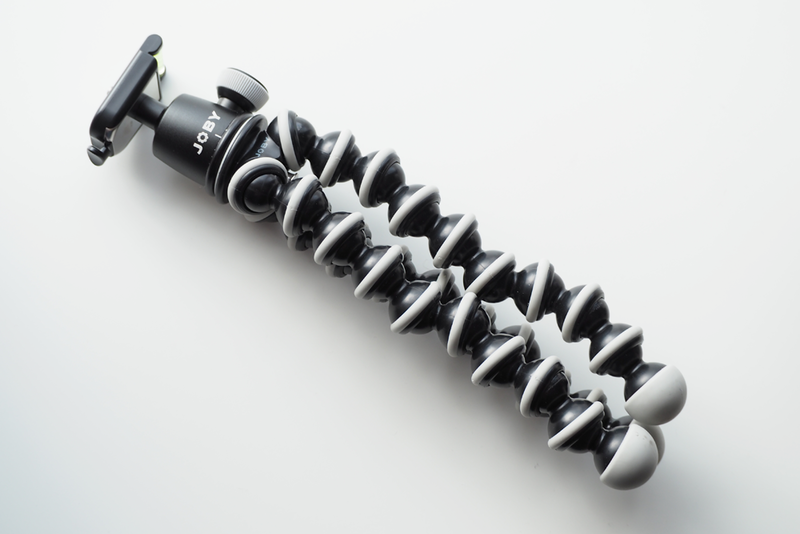 Even though its a very compact tripod, there are still plenty of features packed into this GorillaPod. I got the Ball and Socket Head attachment to go on the top which gives you loads more freedom with where you want to angle the camera. It has a small wheel to tighten and loosen the head which makes it really easy to get it where it's needed. There is also a quick release plate that attaches to your camera which has a spirit level built into it. This means you can have it ready to just slot into the tripod and saves you time when putting your camera on, with the spirit level making fine tuning much easier to get a level shot. 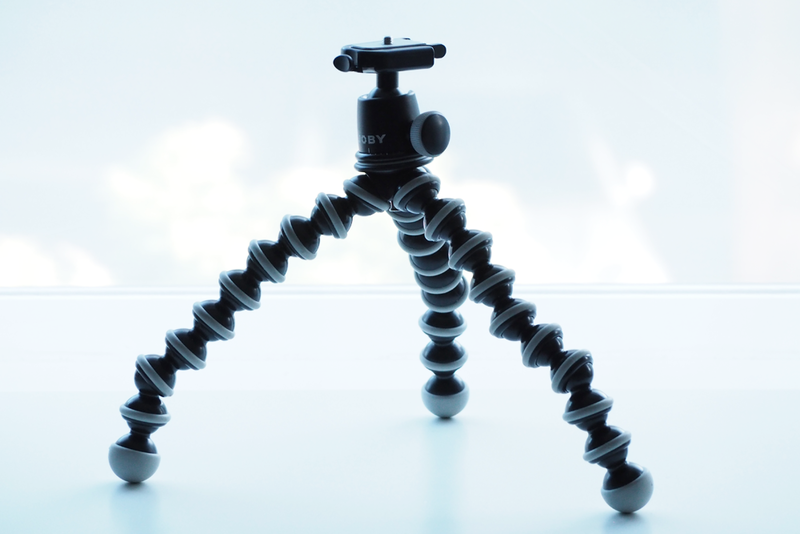 I own another small tripod and a full size Hama Tripod, but if I had to choose to just have one, I would 100% go for this one. I think this is a perfect travel tripod, being lightweight, compact and so easy to carry around and use, and would be a welcome addition to any photographers kit bag. 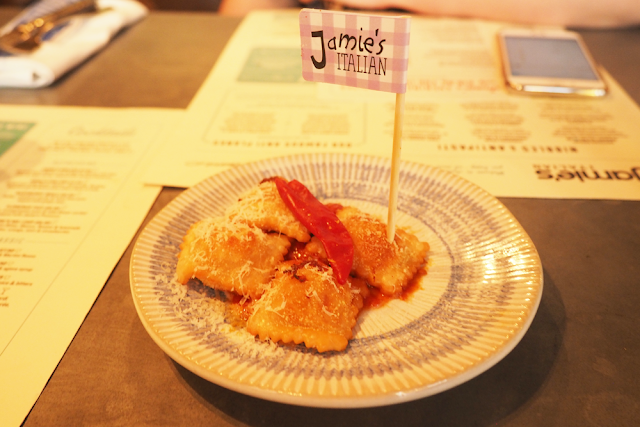 Laura was invited along to Jamie's Italian in Liverpool to try out their new Evening Favourites Menu and she kindly took me along. 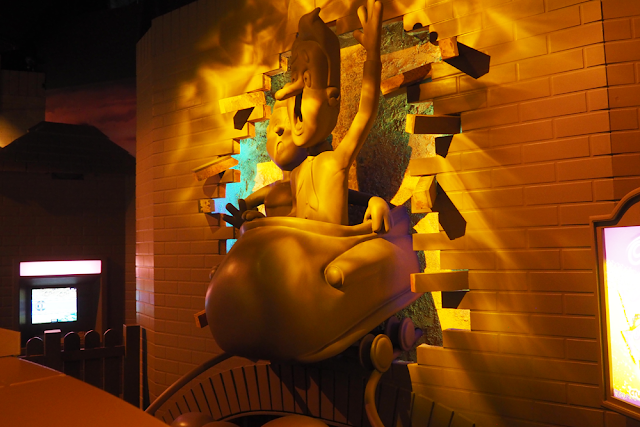 Both of us are fond of the restaurant and have been numerous times to ones in different cities over the past few years with the two of us both having Gold Cards, which are well worth getting if you are thinking of visiting. As this was a new menu, I was keen to see how it matched up to the food I've had before. 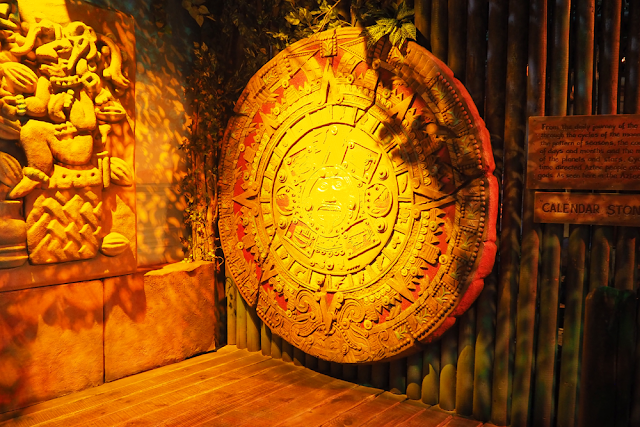 The restaurant has quite rustic decor with a nice layout such as the open kitchen so you can see the chefs at work. This is something I like to see as you can watch them put a lot of care into the meals, which is definitely reflected in the taste. 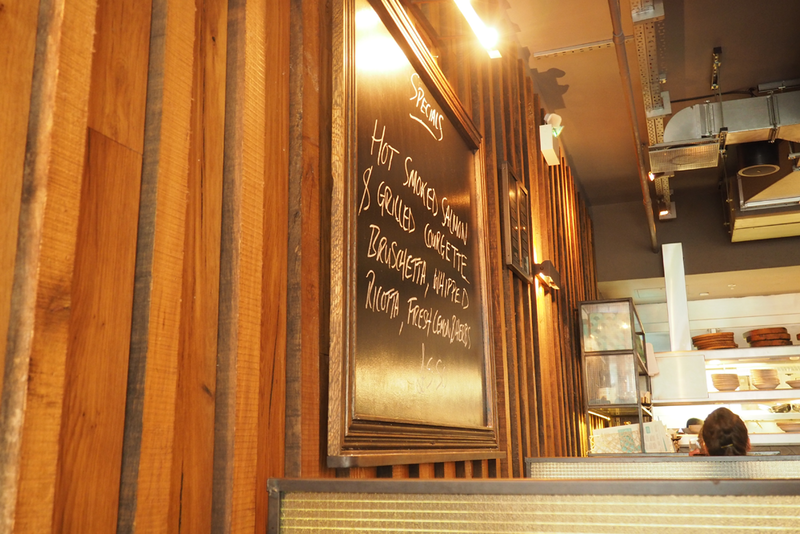 The evening menu costs £18.95 for three courses and is available Monday-Thursday from 6pm. The only extra you need to buy is your drink. One of the perks of having a gold card is that you get a free taster every time you go, and this one was a Italian Nachos, which are fried ravioli filled with mozzarella, ricotta & bella lodi that is served with a spicy tomato sauce. These were a really nice start and would be something I'd have as a normal starter another time. 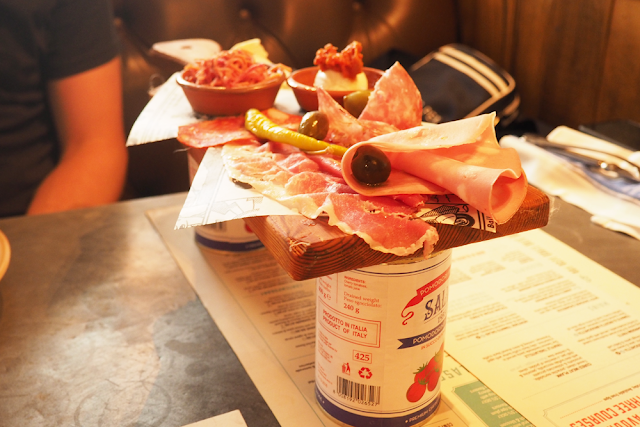 For my starter I went for the Cured Meat Plank which is exactly as you'd expect from the name. 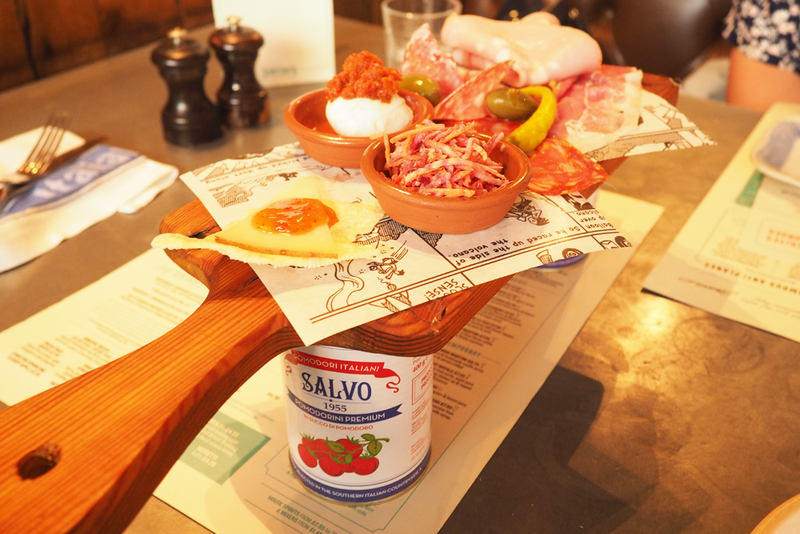 It's served on a long wooden plank rested on top of two chopped tomatoes tins, a nice touch to make it different to what you usually get your food served on. There was a good selection of meats which were: fennel salami, pistachio mortadella, prosciutto & schiacciata piccante with mini buffalo mozzarella, pecorino & chilli jam and a selection of pickles and olives. All this just for a starter is really impressive with a nice range of meat types for a mixture of flavours and generous portion size. 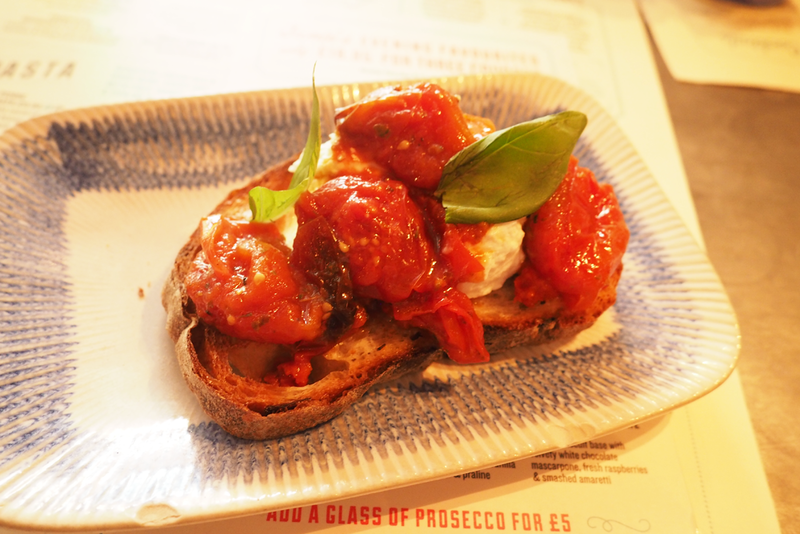 Laura went for the Tomato and Ricotta Bruschetta, which is slow-roasted cherry tomatoes, whipped buffalo ricotta with basil & extra virgin olive oil. I tried some of this and it was full of flavour and you could tell it had been made with fresh ingredients. When I noticed the steak as one of the choices I was surprised, as you don't tend to get the more expensive dishes like steak on a set menu. 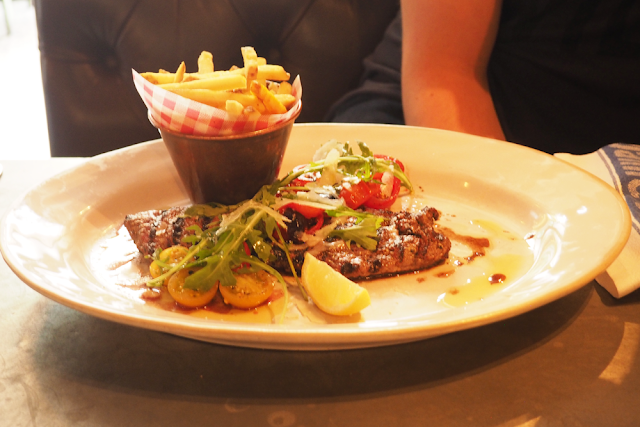 This seemed like too good a chance to miss, so I went for the Italian Steak and Fries, which was a flash-grilled prime beef steak with herby heirloom tomato salsa, rocket, aged parmesan and spiced fries. The steak was a decent size with plenty of flavour, and it wasn't too tough or chewy which I liked, with the fries being crispy with a nicely seasoned. I had a pot of mayonnaise on the side, and even this was really nice and tasted freshly made. Laura went for the Spicy Sausage Casarecce pasta, which was a free-range pork & fennel sausage ragu with British Cobble Lane 'nduja, served with herby breadcrumbs & shaved parmesan. It was a very generous portion, so I wasn't surprised that she had some left over. She normally goes for the lunch portion meals as this is normally plenty and still a good portion size, so with this evening option you are getting plenty of food for your money. It looked so nice that I decided to try some and wasn't disappointed. 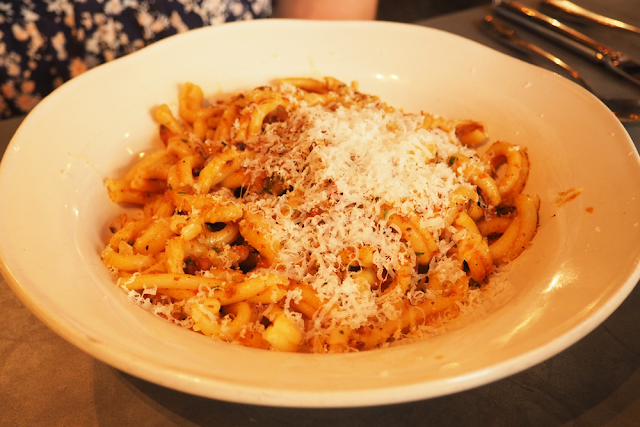 There was a good amount of sausage in the pasta which was nice to see as sometimes big portions are down to extra pasta and not enough sauce and filling. It was flavourful with a good amount of spice so that it was tasty but not too overpowering. There were two desserts that we both couldn't decide between so the sensible choice was to get both and split them. 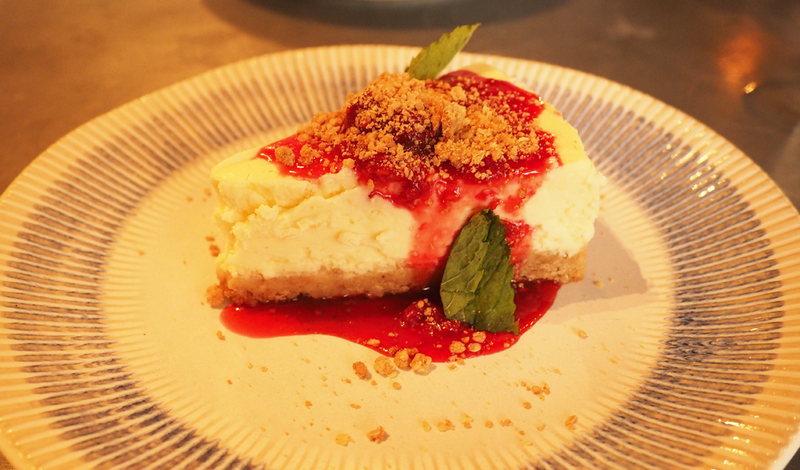 Our first option was the Baked White Chocolate Cheesecake, which is a crunchy biscuit base with velvety white chocolate mascarpone, fresh raspberries & smashed amaretti. I think I may go as far to say it's one of the best cheesecakes I've ever had, with the ratio of biscuit base to topping was really good so it didn't end up being too dry. 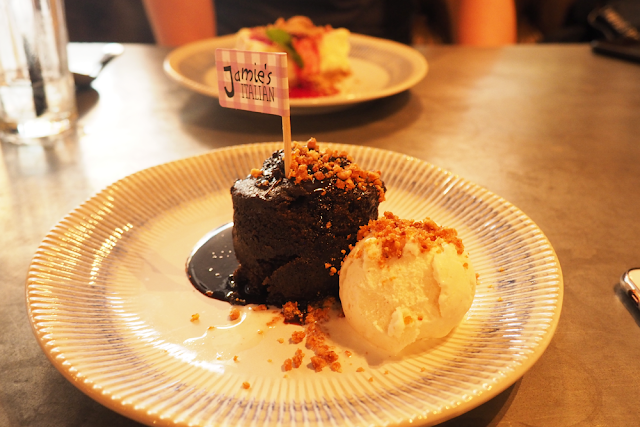 Our second dessert was the Molten Chocolate Praline Pudding, a warm chocolate cake with a liquid praline centre, served with vanilla ice cream & praline. I was really impressed with the cake, as it was moist enough with a nice rich taste and praline sauce, and didn't taste cheap like some of these melt in the middle cakes tend to. Overall I was really impressed with Jamie's new evening favourites menu. It's really well priced for what you get, with a good range of options and generous portion sizes. The food is all full of flavour and really enjoyable, and matches up to other times I've visited in the past. 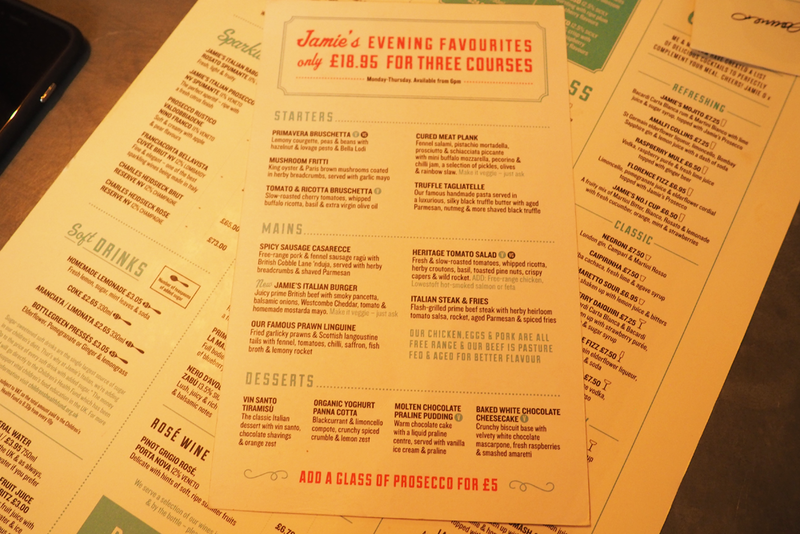 I was so impressed by the Evening Favourites Menu that we are going to head back to Jamie's to try out their Super Lunch Menu. 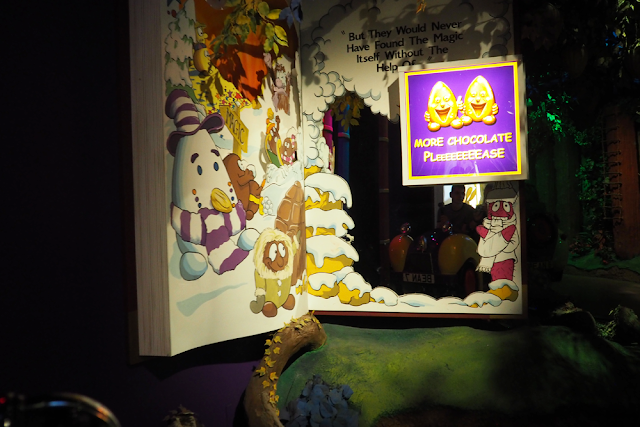 I'd always wanted to go to Cadbury World and last week Laura treated me to a trip down to experience the world of chocolate. I was looking forward to finding out about the history of Cadbury and how their chocolate came about as well as watching how they make some of their products. I loved the setup of the tour and it provided a really interesting way to find out how it all started. At the start of the tour we got three bars of chocolate which was obviously very well received. 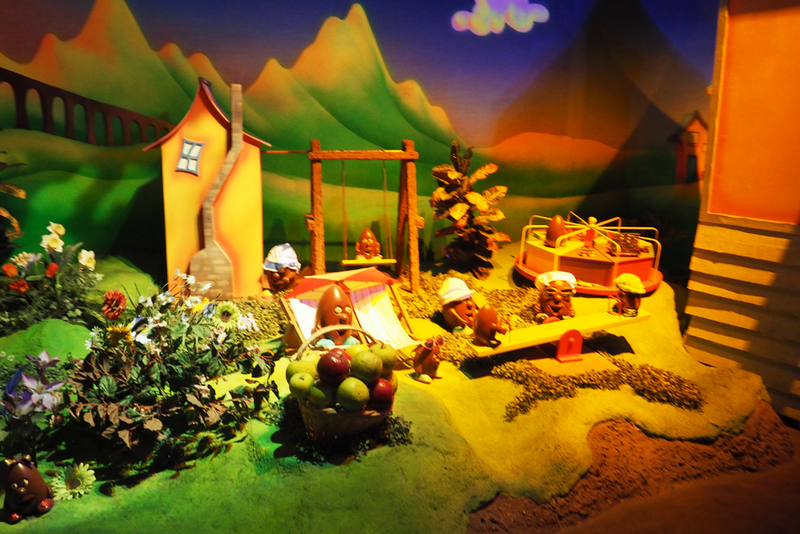 The next few photos were ones from the little ride that tours round the chocolates 'Cadbury World' and reminds me of the 'It's A Small World' ride at Disneyland and gives you a little break from walking around the rest of the tour. This photo below was from the end part of the ride where it's a starry night sky, and it was far too dark to get a realistic photo. 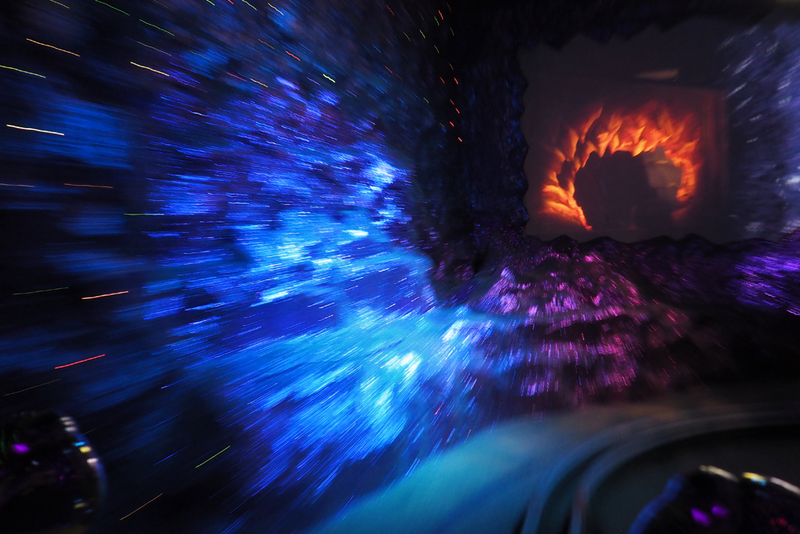 This blurry photo actually looked quite cool and reminded me of the Doctor Who intro. This was one of the other freebies on the way round. 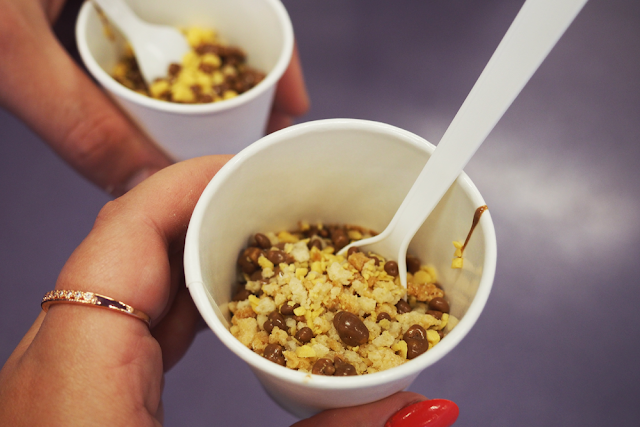 It's a pot of melted milk chocolate and you could pick two toppings to mix in. We both went for shortbread biscuit and Crunchie and it was perfect little sweet treat to keep you going. This amazing construction was made completely from their chocolate. I've seen seen some pretty impressive cakes and models before but to combine them into this is something else. 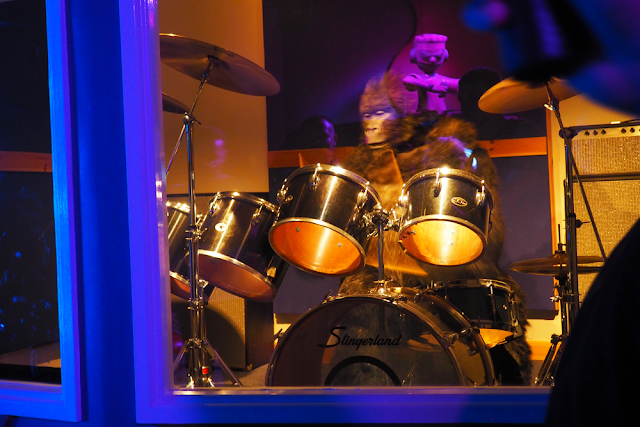 The last few photos are some of the models and set ups that the adverts were based on, with the famous gorilla actually giving you a drum solo of the Phil Collins 'In The Air Tonight'. 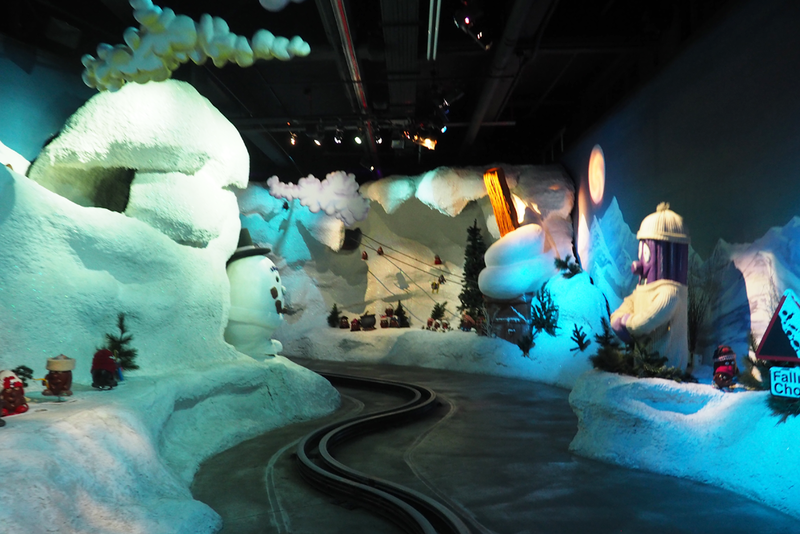 All of these photos were from the tour, which is the first part of Cadbury World. 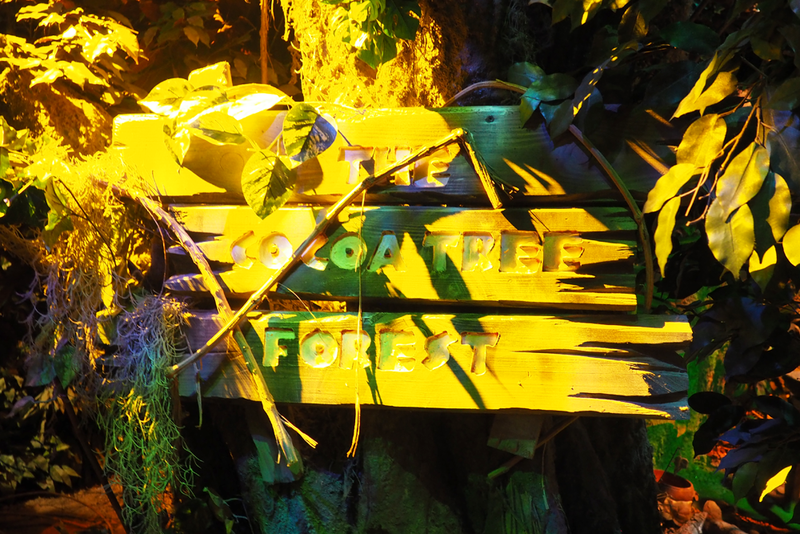 The next part we went to was the 4D Chocolate Adventure which gave you a virtual ride of the Crunchie rollercoaster with 4D cinema experience including motion seats. You couldn't take photos or film in the part but it was a fun little addition and its good for all ages to enjoy. To finish the day we went to the Cadbury Cafe to grab some lunch, which was well priced and enjoyable. 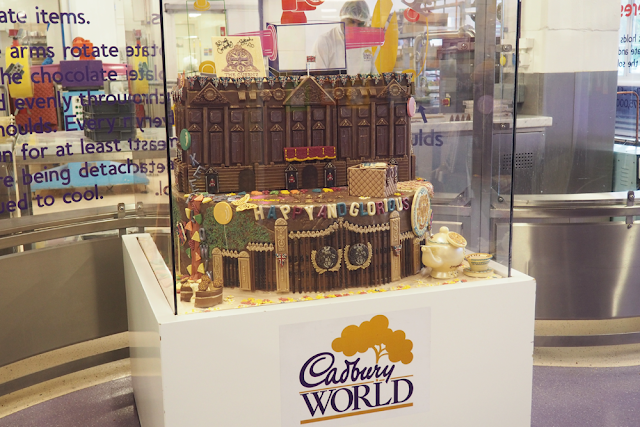 Oh and you can't miss out on the World's Biggest Cadbury Shop, and it would have been rude to leave without picking up a few lot of chocolate. 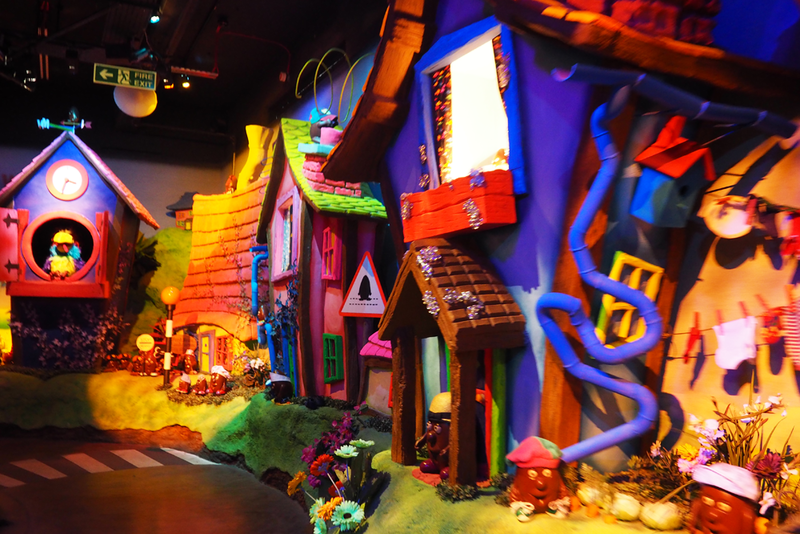 If you like chocolate it's well worth a visit down to Cadbury World, just be sure to pre-book to guarantee entry. I would like to do this before I'm 32, but I want to make sure I can comfortably be paying a mortgage into a house that I can see myself wanting to live in for years to come. I've rented while away at uni which I know is different, but being able to have somewhere to actually call your own home where you can do what you want to the house and put your personal touch on it. I will be starting my dream job in September and I can definitely see myself staying with the company for many years to come, with it really being a career and not just another job. I know I will be working my way through the graduate scheme which involves a lot of learning about the company and how I progress my skills. Like a lot of people, having the motivation and ambition to improve and move up in the ranks would be something to work towards. Settling down is something a lot of people will want at some point, and would be important to me. I'd like to think I could have saved up to have a great wedding and be happily married by the time I'm into my thirties. Don't forget the honeymoon either, this is the time to go away and have a guilt free holiday. I've always wanted to have children during my life, and I would like to wait until I've had chance to live my life a little and save up to be comfortable and ready to have kids. I'm not saying I'd want to have had all of the kids before I turn 32, but would like to have started. I don't mean this in the literal sense of taking a huge trip, but over the years I'd love to have been to different countries and gained some amazing experiences. I have always loved travelling and have already seen some great places which only increases my wanderlust. Laura bought me a scratch map a couple of years so I will be sure to mark off all the different places I go as a memory of my trips. 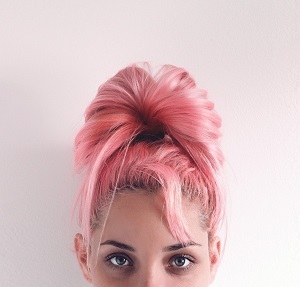 I would really like to keep my blog going and have improved my content and grown my audience. 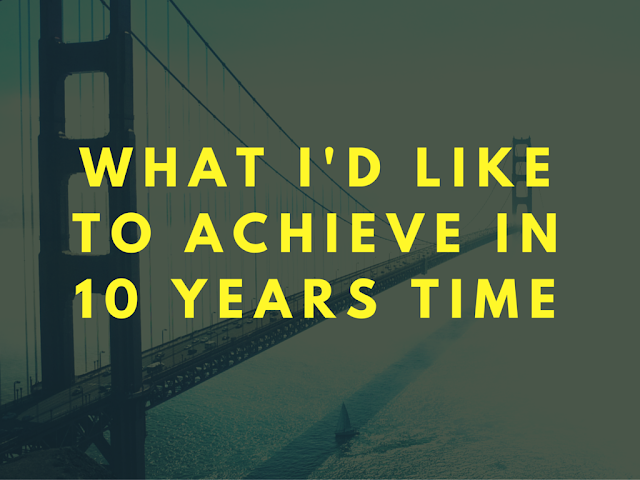 I think it will be really interesting to see where my blog is in 10 years and what kind of posts I'm publishing. Although I'm happy with the camera kit I have now, I would like to have a big DSLR with a range of lenses to help capture some great photo and video content. I know this isn't a huge list of what I'd like to achieve in 10 years time, but you never know what the future will hold, which is a little scary but at the same time exciting. These points I've included are ones that I would really like to have achieved by the time I'm 32. When I got my GoPro Hero I purchased a few mounts such as The Handler, and wanted a storage case to keep it all together and make it easier to take all my stuff out with me. Since getting my GoPro Hero 4 I picked up another case so that I could store it properly along with the other accessories and mounts. It took my a while to decide on the cases I wanted to go for, which included searching for reviews that actually provided useful information rather than a short one line review. I thought I'd put this post together to show you what storage I use for my GoPro's to give you an idea if it would be suitable for what you need. I'll also give my thoughts on how they have held up with usage so it will hopefully be useful when deciding which case to purchase. This was the first case I bought for my Hero after looking at a few different options. Lowepro sell the AVC 1 and AVC 2 which differ in size, and although I only had one GoPro to store at the time, I wanted to have enough space for other accessories and mounts. There is one deeper section with an internal divider so that you can section off an area for your camera as you can see. It also allows you to keep other accessories separate so things like cables don't get tangled in other accessories. You can fit a surprising amount into this section of the case if you pack it properly, although the only downside to more space is that it can rattle around if you don't have much in the case. The other side of the case is separated by a pull back foam cover that Velcro's down to reveal a removable accessories tray for small parts. This comes in very useful and I store things such as the adhesive and tripod mounts, along with the GoPro tool and quick release mount. 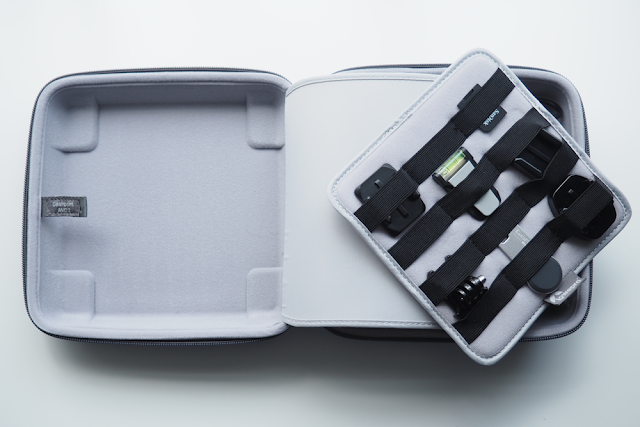 The neat elastic keeps all your items secure and stops them rattling around within the case. 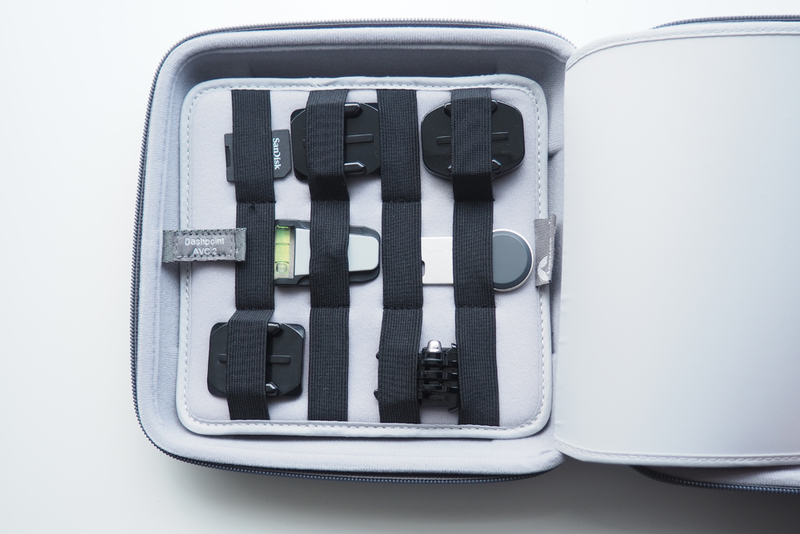 The case flips together to keep everything tight inside and then zips around the middle. The whole case has a hard exterior which will help to protect your gear from damage. Overall I have been really impressed with how many accessories you can fit in this case along with the camera, and it performs well from my experience. It has held up well after taking it out on multiple occasions when it may have just been thrown in a bag, and it shows no signs of damage. These case give you a little more freedom with what you want to pack in rather than having specified spots for items. This is the case I bought when I got my Hero 4 and I opted for a different brand and case design. 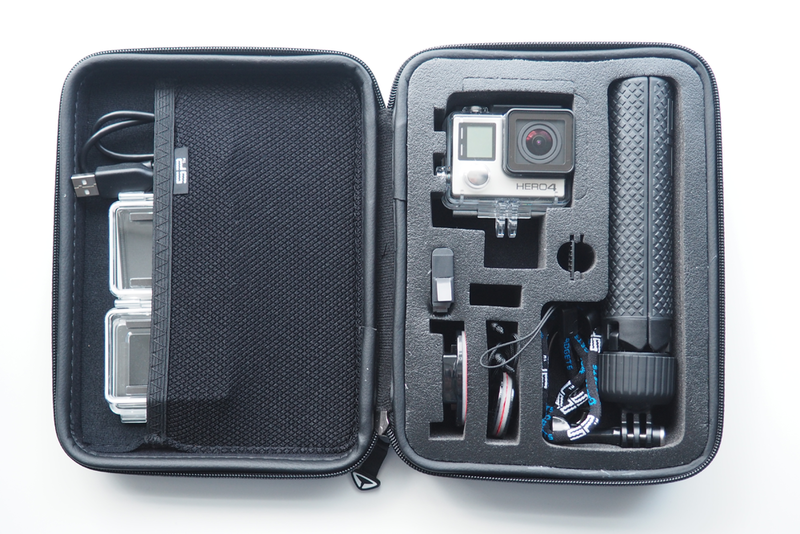 This is a GoPro specific case and has cut outs in the foam padding to fit the camera and other accessories. It has space for two spare batteries and memory card slots. There is a large cut out area to fit the SP Gadgets Tripod Grip which is great so that this will always be there if you take the case out. If you didn't need the tripod grip, you can always fill this space with some other items. SP Gadgets also sell different sized versions of this case so this is something to consider if you like the case but want more storage capacity. On the other side of the case is an mesh pocket with an elasticated top which can be used to store extra accessories in. At the moment I use this to put my USB cable and spare back doors for the camera as they tuck away nicely and means you can change while you are out depending on the activity. This case also has a hard exterior to protect what's inside and zips around this middle, which also has some sort of covering over the zip, which may be to protect again water getting into the case. Overall I really like this case as it is perfect if you were to be going out for the day to film what you get up to as it can hold everything you should need, with the tripod grip giving you two mounts in one, the spare batteries and changeable back doors. It's quite a lightweight case which is good when you are carrying it for extended periods of time, but still is protective enough to prevent harm. 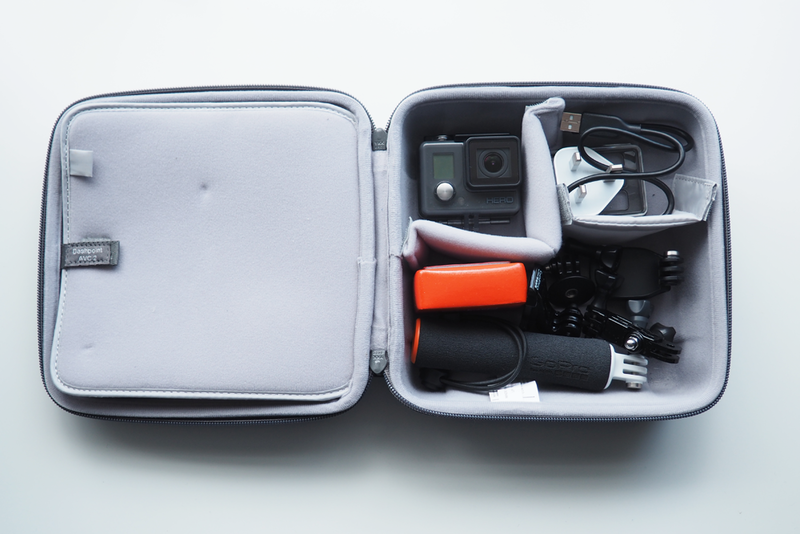 To sum up, the Lowepro case is a generously sized protective case that can fit plenty of equipment in, and could be used to store more than one GoPro and/or extra mounts and accessories. 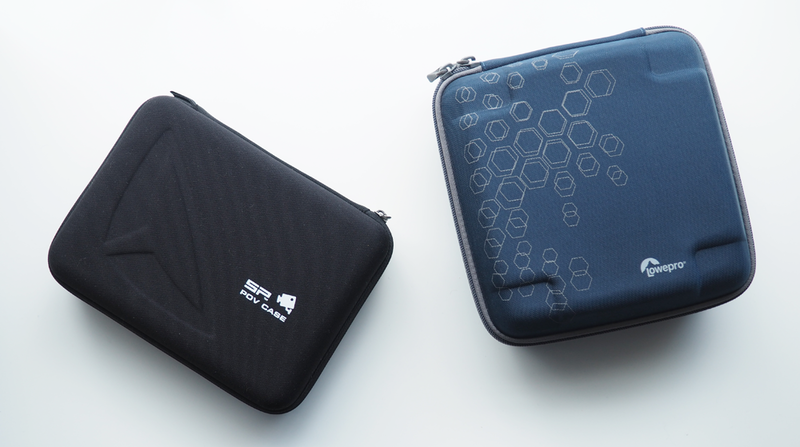 The SP Gadgets case is noticeably smaller but has specific spots for you kit which may appeal more to some. Both cases have a hard exterior so that you shouldn't have to worry if they get knocked around a bit, plus the fact that they both come in different sizes. I hope this round up of my GoPro storage has helped if you are trying to decide on a case to purchase. If you have any questions you can comment below, or tweet me @amsblog. Tech Talk - Which is the Favourite? I have only ever had an iPhone and I think this is because I love the operating system and how easy the phone is to use. Having used and played on other peoples phones that run Android, I just didn't like way it was set out but that's just me! I was kind of expecting this as the result as a lot of people have moved over to iPhones. 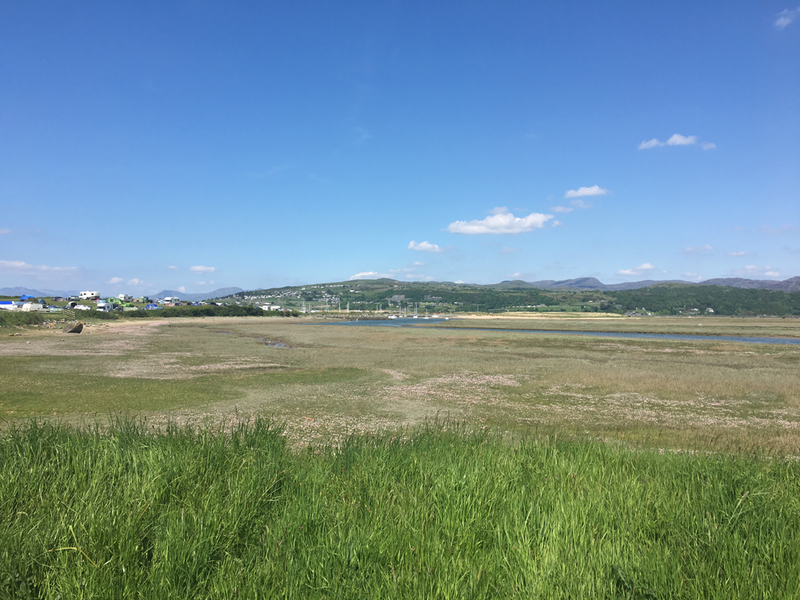 Especially seen as there are a lot of useful apps on iPhones, I think this sways many bloggers to move to them as it makes it easier to do blogging related things on the go. Having only ever owned a Windows laptop, you would think this would be my favourite however since I have started blogging and using the laptop for photo and video editing, I would much prefer to have a Mac as the operating system and features are much better for what I would be doing. I think the difference in price is another factor I currently don't have a Mac and is what might be a reason for others. I was a little surprised at how many people have Macs although they are extremely popular for bloggers as it makes life a lot easier. I think the price tag of Macs will prevent some people getting them, I know I would love to have one, so I think they is why more people are still using Windows laptops. Console: PlayStation, Xbox or PC? I never really got into playing games on a PC and even though I haven't owned an Xbox I've played my fair share of on both consoles. Even though there are some games on Xbox I'd like to have, there were just more games on the PlayStation that I wanted to play so this won me over when I got my PS3 6 years ago. I know there aren't loads of votes here but I was still a little surprised at the results. For one I was expecting PlayStation and Xbox users to be more balanced as I thought they were both as popular as each other. PC takes a third of the votes which is what I'd expect as this is what a lot of people started gaming on and what serious gamers may use more. Camera: DSLR or something smaller? With my dad being really into photography, he got me into this from a young age. I've owned a few different cameras in the past few years, starting with a compact film camera when I was younger. A couple of upgrades later I had my first digital compact camera and loved using it. Since then I went to my current bridge camera, a Fuji S100FS. This is around DSLR size and I much prefer having a bigger camera for taking photos and wanting to upgrade to a DSLR some time in the future, I'd have to choose this as my choice. I think these results were to be expected as each camera has pros on cons. 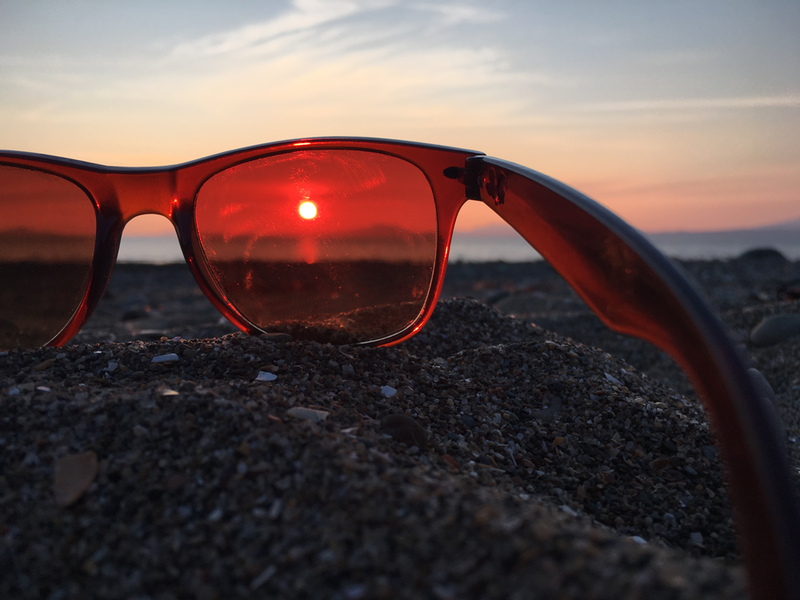 As much as a DSLR provides amazing photos, it will often require having more than one lens to cover different situations, and does often cost more to purchase. I think with the increase of compact high quality cameras such as the Olympus Pen, more people are choosing these as they can still produce high quality images for often a lesser price and much smaller overall design. This will obviously depend on circumstances when I was going to buy a camera, but already having a good camera, I think I would rather save up for longer to then be able to spend more, so I think I'd go for £600+, as I would see this as an investment as I would have it for years and it would be worth spending more to upgrade in the long run, rather than spending less on a camera that is only slightly better than my Fuji S100FS. This will probably depend a lot of how into photography you are, as you wouldn't just go out and spend a big chunk of money on your first camera. This is represented in the results as the more expensive the price, the less percentage of the votes. What would you listen to music on the most: Earphones, Headphones or Speakers? At the moment I'd say I use my speaker most as I don't take headphones out with me that much and when I'm at home I prefer to play music out loud. I think if I answered this last year it would definitely have been earphones as I always took my iPod into Uni while completing assignments etc. Earphones quite clearly won this one, and I have a feeling this is because a lot of people will listen while on a commute. Often people don't want to carry big headphones around with them so may be used more at home, but I was still expecting more people to use them. Speakers still take a fair chunk of the votes, and I'm guessing this is for using at home. So there are some of my technology preferences and your voting results, it's really interesting to see what other people's choices are. This time last year I had finished uni and would be having my graduation in the July. This was the end of uni life which also meant moving out of my uni flat. 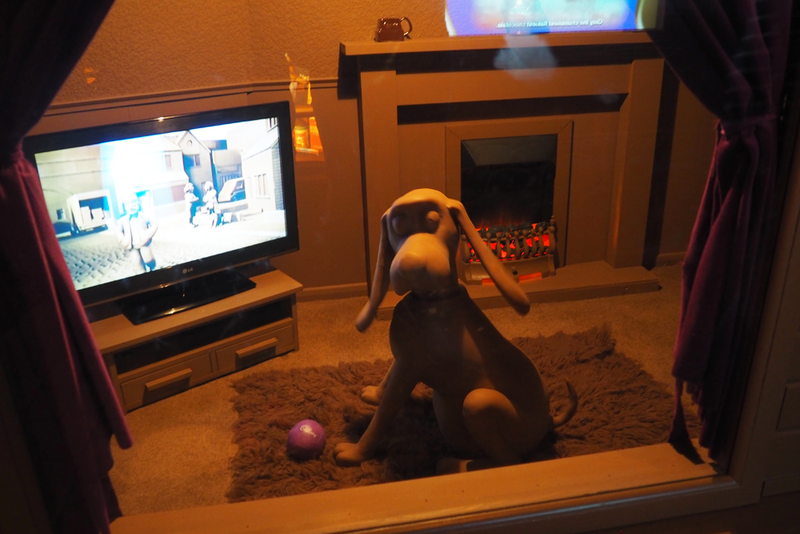 I had lived in halls for my first year like many students do when they move away from home. For my second year I rented a shared house and for my final year it was a 2 bed flat for me and Laura. Students are sometimes know for being a little messy: dirty dishes left in the sink for days, the bin overflowing with rubbish or a rather dirty floor that was the result of pre-drinks weeks ago. As much as you try to keep it clean through the year, there isn't always anyone to tell you to keep it that way (unless your landlord comes to do checks, so be aware that this could happen). The most important clean of your house or flat will be your end of year one when everyone is moving out. 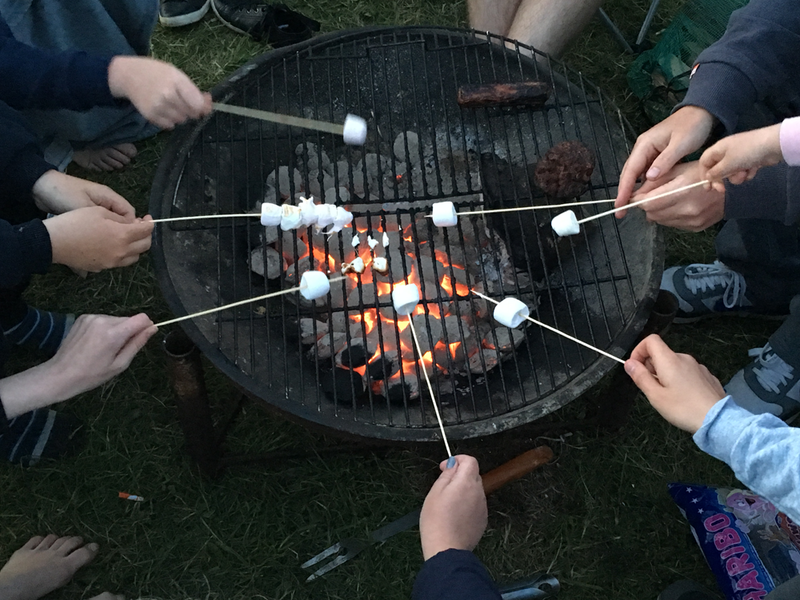 Other things that you may forget about are bills you have been paying through the year, so making sure these are sorted it very important to avoid getting chased for something you are no longer using. Some landlords will be much more picky when it comes to cleaning your house, with some setting out how they want it done. In my second year, the landlord gave us a 3 page checklist of everything that needs to be done. Some of it may seem a little ridiculous, but to ensure you get your full deposit back, you just have to follow what they want so you have done everything the asked and then, as long as there is no damage, there should be no reason they can give for not giving you all your money back. Other landlords may 'advise' but from my experience this is really not needed unless there is some serious damage or marks for example. In my final year, me and Laura cleaned the flat top to bottom ourselves, and when the landlord came to check us out, she told us it was the cleanest she'd ever seen a student flat. Here are some simple things to remember when giving your house a full clean that may sound obvious but are very important. This may well have gone a miss during the year, especially the areas you can't obviously see. Make sure you clean the tops of your wardrobes and shelves that you don't tend to put things on. You might think that if you can't see the dust, it won't be a problem, but this may well be one of the first places a landlord will look. 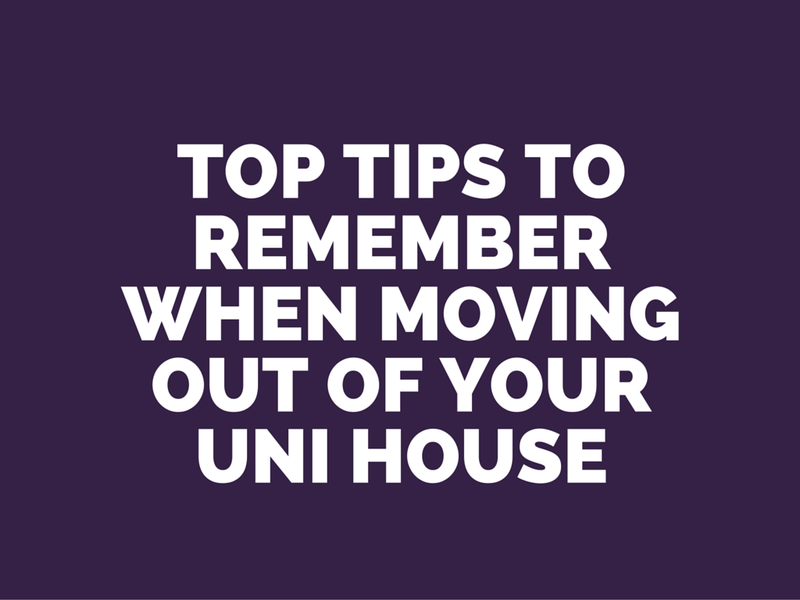 Hopefully you will all have used the hoover at some point during the year to whizz round, but when you are moving out, make sure you hoover behind all your furniture. If possible move things such as your bed and drawers out so you can clean every last bit of dust or food that may have fallen behind there at some point. If you have ever hosted pre-drinks at your house, you may well have experienced the sticky floor the next day from numerous drinks that were spilled. Hopefully the floor will have been cleaned before the end of the year, but mopping every hard floor surface will ensure nothing gets left behind and can make the room look a whole lot cleaner. If the landlord comes in and sees a shiny floor, they may be less inclined to try and pick faults in other areas of the room. Quick tip here, it's probably best to mop once all your stuff is moved out so you don't end up walking all over the clean floor. Even though you have cleaned all the worktops and the floor in the kitchen, cleaning the cupboard doors and handles, as well as the insides is a good idea. In my second year we were specifically asked to clean every part of the cupboard including the shelves. It may sound like an obvious point, but it may get overlooked if you have already emptied all of your food and kitchen stuff out and you don't open them back up when you go round cleaning. This will vary for different landlords but at the very least these need to be both fully emptied of food and thoroughly clean. For the freezer, the likelihood is that it will need to be defrosted so that it's not full of ice on the shelves. Some landlords will ask you to turn off your fridge and freezer if new people not moving in straight away. If this is the case, you need to fully dry out the fridge and leave the door open to prevent mould developing inside. With the freezer it will need fully defrosted which will sometimes leave you with a big puddle of water if you don't have towels to hand, so think ahead when doing this. You many have cleaned all the main places and the house will hopefully be looking pretty clean. There are a few places to check before you can finish and should only need a wipe down. Be sure to clean your door handles, light switches, plugs and skirting boards as they will either have collected dust or be covered in dirty fingerprints. In my first year all of the bills were included in the rent for my halls so I didn't have to worry about this. 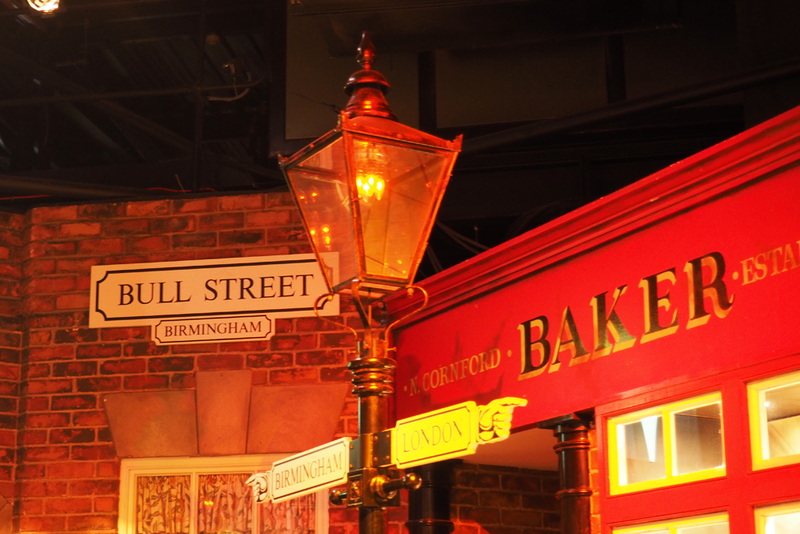 When it comes to privately renting, this will all change. Sometimes landlords will give you the option of paying extra money of top your rent to include some or all of your bills. If you have set up your bills yourself, there are a few important steps to follow. When you know when you will be moving out you will need to contact the different companies responsible for billing you. You need to tell them when you will be moving out and that you require a final bill. This is important to ensure you don't keep paying once you have moved out, and so that the company knows you are no longer responsible for that property. One thing to check before your tenancy comes to an end is how much notice you are required to give prior to you moving out, as some may be a month or longer. What I did was to call them up a few months before moving out to ask how it works so I wouldn't end up paying more. Another thing to consider is asking the company if they can provide you will a loyalty deal if you will be moving into another property the next year, you will be surprised what they will offer you if you tell them you will go with another provider. You will at least have gas and electric meters in the property and sometimes one for water. Companies will probably ask you for your final meter readings so they can calculate the correct final bill. One tip here is to take a photo of these meter readings so you have a record of what they were if there is ever a query about what they are. This may vary depending whether you are paying by direct debit or not, but it is important to check over the final bill they send you. Sometimes students may be easier targets to overcharge as they are not used to paying bills, or it may be a genuine mistake from the company. I know it's difficult to know exactly how much it should be, but if you are ever unsure about what you have been charged, contact them and ask for the bill to be explained. You may end up getting some money back if you incorrectly charged. These are some of my tips and advice for when you are moving out of your uni house to make sure that you get the correct deposit back and so you don't end up getting overcharged for your bills once you have moved out. If you have any questions or need some more advice, you can either leave me a comment below, tweet me @amsblog or email me at: andrewmarksmithblog@gmail.com. Over the bank holiday we decided to take a trip down to Shell Island in North Wales, which is a huge campsite. The weather was absolutely amazing, being able to sit out in the sun all day long. These are a few of the photos I took while we were away, and I've included a short vlog at the bottom of the post. Watching the sunsets on the beach was great as you had an amazing view out to see to watch it drop below the horizon. 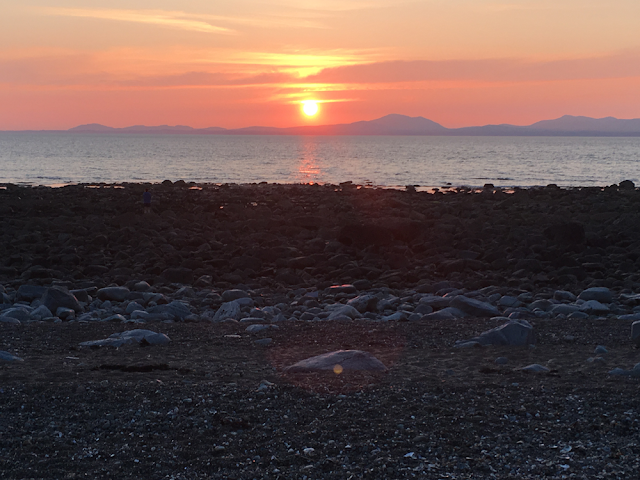 Check out the vlog for a couple of sunset time-lapse clips. This was our view as we opened up our tent, with blue skies greeting us every morning which was a lot better than some views I've had from my tent in the past. I decided to take a little trip out in a kayak that one of our friends had brought with them. 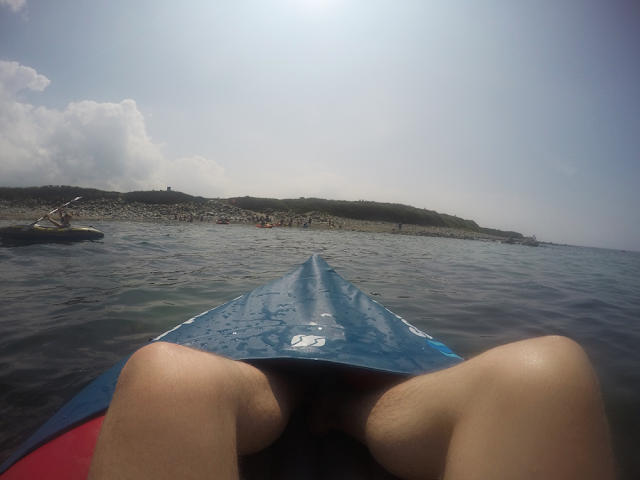 It was so calm in the sea and actually quite relaxing to paddle out and float in the sea. This was my GoPro setup on the beach in the evenings to capture the sunsets. 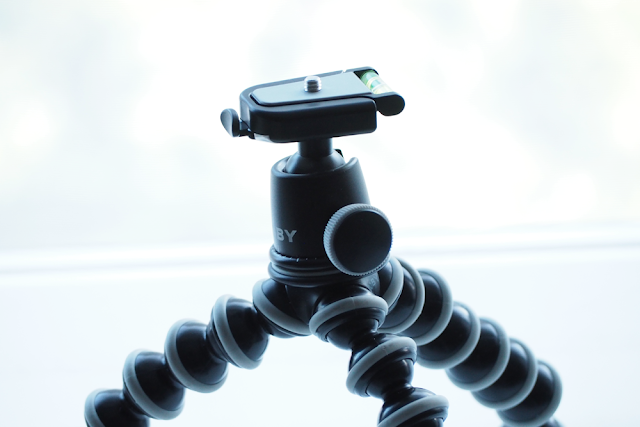 I had one on my Gorillapod and one set up on the egg timer to get a panning time lapse. Check out the footage I got in the vlog below.